The M Locus (Merle) coat color test reliably determines if a dog carries the M (merle insertion variant) Allele of the PMEL gene. If present, this test will also determine the approximate size (+/- 1 base pair) of the M allele(s). Merle is inherited in a dominant fashion, meaning that only one copy of an M allele is necessary for a dog to display some variation of the merle coat color/pattern, which is marked by random dilution of eumelanin (black pigment) leaving patches of normal coat color within areas of diluted pigmentation. 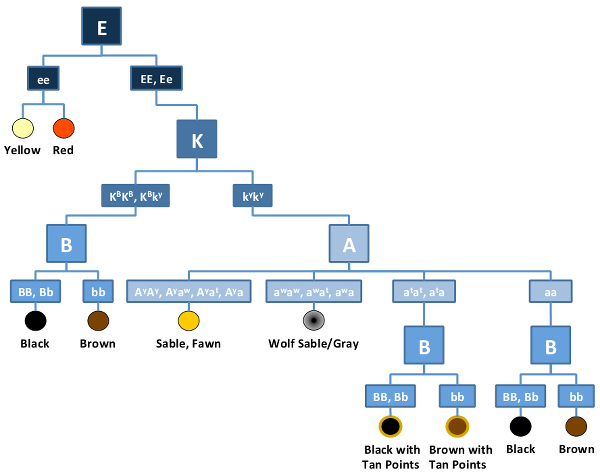 The M allele impacts canine coat color by altering the expression of the PMEL gene which is primarily located in eumelanosomes that produce and store eumelanin (black pigment). Therefore, the M variant of PMEL typically affects only eumelanin pigmented areas and not phaeomelanin (yellow/red) pigmented areas. The patchiness of the merle coat color is thought to be due to the unstable nature of the M variant which results in patches of skin cells with different sizes of M alleles that may express the coat color or pattern differently. The size of the of the M allele(s) present in a dog have been associated with different merle coat colors/patterns. In addition, two copies of the M allele large enough to produce the merle coat color are thought to cause the death of skin melanocytes, retinal pigment cells, and melanocytes of the inner ear which can result in significant white areas of the coat, eye abnormalities and deafness. Specific sizes of the M Allele have been associated with the potential to produce “classic” merle patterning or other M-associated coat color variations. Merle is most appropriately viewed as a spectrum of coat colors/patterns and the size of the variant M allele is associated with a coat color/pattern somewhere within that spectrum. Although some coat color/pattern variations have been associated with specific sizes of the M allele in certain breeds, referred to here as a ‘bin’, the size of the M allele does not guarantee a specific outcome. In general, dogs with M allele sizes between 200 – 246 base pairs (bp) have been associated with non-merle or minimal-merle coat colors/patterns and are often referred to as “cryptic” merle; M allele sizes between 247 – 264 bp have been associated with “atypical” or “diluted” coat colors/patterns; M allele sizes between 265 – 269 bp have been associated with the “classic” merle coat colors/patterns; and M allele sizes between 270 – 280 bp have been associated with “tweed”, “harlequin” or “patchwork” merle coat colors/patterns. 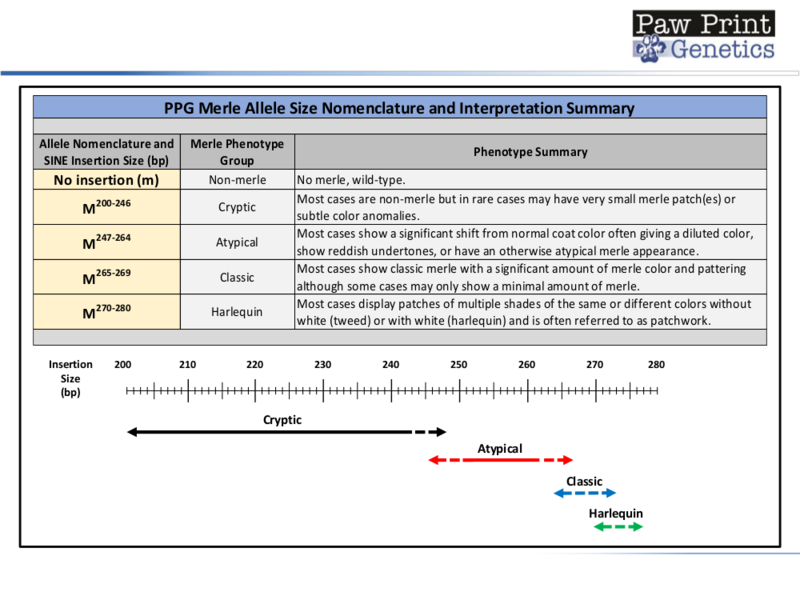 A table summarizing the difference between the old vs new Paw Print Genetics M allele size nomenclature is shown below along with a figure illustrating the overlap between bins. Many exceptions to the coat color/pattern associations found in the various M allele bin sizes listed here have been identified. Therefore, care should be taken when correlating M allele sizes with anticipated coat color/pattern outcomes. These bin sizes should not be interpreted as having discrete boundaries but should be viewed as a range within which specific coat colors and patterns are likely. Variations in genetic background between breeds and in individual dogs within a breed may result in the identification of different coat colors/patterns not typically found in a given bin, especially when the size of an M allele is at the border between bins. Furthermore, due to the complex nature of the merle insertion variant and the limitations of currently available molecular technologies, precise sizing of the merle insertion variant is challenging. However, the sizing of the merle insertion variant in our laboratory has been validated to be accurate to within +/- 1 bp which, nevertheless, makes correlations between genotype and coat color/pattern of dogs close to the boundaries of a specific bin potentially problematic. In addition, the M allele bins defined here are only relevant to test results generated by Paw Print Genetics. The variable nature of the M gene variant and subtle differences in methodologies used by each laboratory precludes strict interlaboratory genotype comparisons. Therefore, in some cases, it may be prudent to test related dogs in a single laboratory if comparisons across related dogs or dogs within a breed are desired. The inherent instability of the M insertion variant makes it susceptible to further Mutation events that can result in “mosaicism” whereby more than one version (allele) of the M insertion variant of a potentially different size is found in various cells throughout a dog’s body. Indeed, mosaicism is likely what gives a merle dog its variable coat color/pattern with some cells having a copy of one M variant allele that results in altered pigmentation while other cells may have a different sized insertion resulting in an alternate form of the M variant allele that may express the coat color or pattern differently. It has also been documented that, due to the inherent instability of the M insertion variant, changes to the M insertion variant size can occur during the replication of each M allele, which may result in subtle changes in M allele size from cell to cell (mosaicism) and even from one generation to the next if present in egg or sperm cells (germ cells or gonads). However, current evidence suggests that lengthening of the M insertion variant is less likely to occur than shortening, although either event is theoretically possible. Thus, this “mosaicism” may result in different alleles of the M insertion variant being present in different cell lines or tissue types in the same dog. Importantly, if the mosaicism occurs in the germ cells (sperm or eggs) of a dog, the different alleles of the M insertion variant may be passed on to offspring. Furthermore, this mosaicism may be found in only a small percentage of cells and may not be present in the cells from which a given sample is obtained from a dog for genetic testing, making it difficult to always reliably detect mosaicism. Thus, all levels of mosaicism may not be detected by this test. If identified, mosaic M alleles at ~5% or greater of the total M alleles detected will be reported in the final genotype with the approximate percentage of each M allele identified in brackets. Dogs that are identified as having a mosaic genotype may pass on each of their mosaic M alleles if they are also present in the germ cells of the dog. Germline mosaicism can only be confirmed by testing samples obtained from sperm or eggs. Dogs that inherit two copies of the M insertion variant are at an increased risk of being mostly white with hearing and/or vision deficits. To avoid producing “double merle” (M/M) puppies, dogs with a copy of M (particularly those with M alleles near the size which is likely to produce the classic merle coat color/pattern) should only be bred to dogs that do not have a copy of the M allele. This test will determine if the dog has one or more copies of the M (merle insertion variant) allele. The following are some of the potential genotypes that may be identified. Other variations of these genotypes may also be identified. This dog carries two copies of m, the non-merle, wild-type allele of the PMEL gene, and, therefore, does not have a merle coat color/pattern. This dog will pass on one copy of the m allele to 100% of its offspring. This dog carries one copy of the m (non-merle, wild-type) allele and one copy of the M (merle insertion variant) allele of the PMEL gene. This dog will pass on one copy of the m (non-merle, wild-type) allele to 50% of its offspring and one copy of the M (merle insertion variant) allele to 50% of its offspring. The approximate size of the M allele of this dog (+/- 1 base pair) is listed in superscript in the genotype. Merle is inherited in a dominant fashion, meaning that only one copy of an M allele is necessary for a dog to display some variation of the merle coat color/pattern, which is marked by random dilution of eumelanin (black pigment) leaving patches of normal coat color within areas of diluted pigmentation. The impact of the M allele on this dog and its offspring will be determined by the approximate size of the M allele found in this dog (see detailed summary above). This dog carries two copies of the M (merle insertion variant) allele. The approximate sizes of the M alleles of this dog (+/- 1 base pair) are listed in superscript in the genotype. This dog will pass on each of the two copies of the M (merle insertion variant) allele to 50% of its offspring. Merle is inherited in a dominant fashion, meaning that only one copy of an M allele is necessary for a dog to display some variation of the merle coat color/pattern, which is marked by random dilution of eumelanin (black pigment) leaving patches of normal coat color within areas of diluted pigmentation. The impact of the M alleles on this dog and its offspring will be determined by the approximate size of each M allele found in this dog (see detailed summary above). Depending on the sizes of the M alleles present, this dog may be an affected, "double merle". Dogs that inherit two copies of the M allele insertion variant of a certain size are at an increased risk of being mostly white with hearing and/or vision deficits. This dog carries one copy of the m (non-merle, wild-type) allele and mosaicism for two different copies of the M (merle insertion variant) allele of the PMEL gene. Mosaicism means that the cells within your dog each carry one copy of m and one copy of M, but each cell may carry either copy of the M allele. This dog will pass on one copy of the m (non-merle, wild-type) allele to 50% of its offspring and one copy of the M (merle insertion variant) allele to 50% of its offspring. If the mosaic copies of M are present in the germ cells (sperm or eggs) of this dog, this dog may be able to pass on the different alleles of the M variant to its offspring. The approximate size of the M alleles of this dog (+/- 1 base pair) are listed in superscript in the genotype. Mosaic M alleles at ~5% or greater of the total M alleles detected will be reported in the final genotype with the approximate percentage of each M allele identified in brackets. Merle is inherited in a dominant fashion, meaning that only one copy of an M allele is necessary for a dog to display some variation of the merle coat color/pattern, which is marked by random dilution of eumelanin (black pigment) leaving patches of normal coat color within areas of diluted pigmentation. The impact of the M alleles on this dog and its offspring will be determined by the approximate size of each M allele found in this dog and the approximate percentage of each mosaic allele present (see detailed summary above). There may be other causes of this condition in dogs and a normal result does not exclude a different mutation in this gene or any other gene that may result in a similar genetic disease or trait. Merle patterning and colors may be influenced by other known and unknown gene mutations that can affect coat color. The unstable nature of the M variant, as described above, is thought to be the basis for a variety of coat colors and patterns in merle dogs. Genetic testing of the PMEL gene will determine whether a dog has no copies or one or more copies of the merle insertion variant. However, breeding of dogs with known merle insertion variants to each other may increase the risk of "double merle" pups with hearing and vision problems.